Juventus just edged a tight 0-0 at the Juventus stadium, giving them the point they needed to qualify for the last 16 of the Champions League. It was a tight affair, much like the first leg, with Juve pressing Atletico early on in the first half. Carlos Tevez tried to find a way through a well drilled and disciplined Atleti defence while Fernando Llorente struggled yet again to get into the match. As the game wore on and it became apparent that the deadlock would not be broken without taken considerable risk, Allegri’s men settled for a draw, passing the ball around comfortably for 10 minutes as the match drew to a close. Do you agree with our ratings ? Have your saw below. Juve certainly looked better for having him in the team. Ran the right flank with his usual industry and tried to deliver useful crosses into the box. 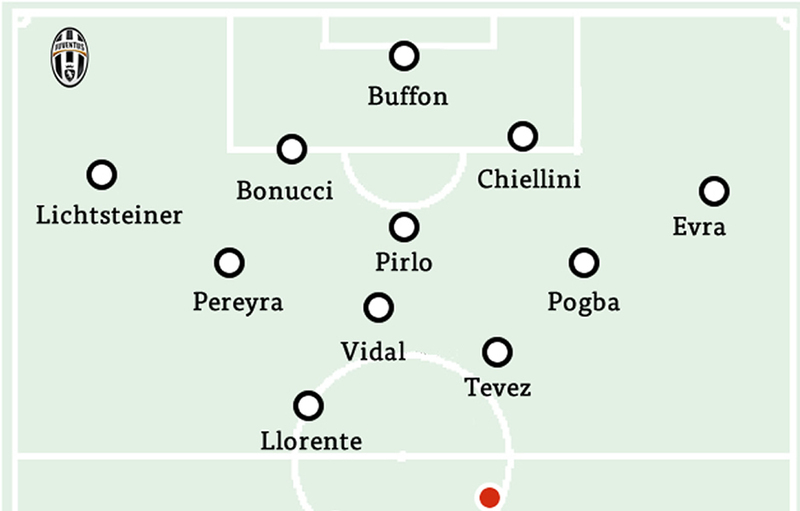 Defensively solid and won Juve a series of dangerous free kicks in the Atlti half. Drew fouls when he needed to, strong in the box and rarely put a foot wrong. Kept his composure late on as Juve played out the draw. Made runs out of the box and helped his team in attack when bringing the ball out to try and create something. Left nothing to chance when heading the ball out on more than one occasion. A good display from the veteran full back. Defensively sound if slightly lacking in the attack. Linked up with Pogba as usual and gave a decent account of himself. Failed to really threaten the Ateltico defence, his passing left a lot to be desired on occasion but definitely an improvement from his display at RWB. At the heart of the few positive moments Juve had. Played better on the left with Evra, played a perfect ball into the box but Llorente headed over and managed to test Moya with an effort from outside the box. Reckless tackles early on made way for a few decent efforts from distance but not much else in terms of creativity. Looked lively in the first half by trying to get in amongst the Atleti defence but failed to make more of an impact in the game. Set up Pogba and Vidal’s shooting chances late on. Had a great chance from Pogba’s cross but failed to capitalise. Yet another frustrating night for the Spaniard who held the ball up well but lacked any real service from his teammates.